Taste test: These are very flavorful chips, with a clean potato taste, crisp vinegar bite, and a fine balance of salt. A true delight! 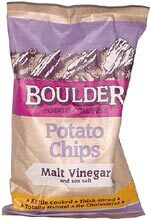 Lots of people enjoy vinegar chips, and these rank among the very best of them. Smell test: Malt vinegar, potatoes, a little scent of heaven.